A dyno reading confirms the new BMW M5 makes more than 600 horsepower. With 600 horses and 553 lb-ft of torque on tap, the is the most powerful M5 in history. That’s enough grunt to allow it to hit 62 mph in just 3.4 seconds and 124 mph in only 11.1 seconds. However, it turns out BMW’s latest super sedan is much more powerful than the automaker is advertising. As we , automakers tend to be conservative with horsepower ratings, and the same appears to be true with the new BMW M5. As reported by , Illinois-based tuner IND Distribution, which specializes in making fast BMWs, hooked the F90 M5 up to a dyno to find out how if BMW has been downplaying the sedan’s output. The tuner followed the proper break-in procedures by waiting for the car to cover around 1,200 miles before unleashing its twin-turbo V8. The result? According to the dyno, the M5 produced 625 horsepower and 608 lb-ft at the wheels. Factoring a drivetrain loss of around 10 percent, this would put the V8's crank output at around 690 hp, meaning that BMW has been underestimating the M5’s figures by around 100 horsepower and over 100 lb-ft.
Those are some seriously impressive numbers - if these figures are accurate, the new M5 is about as powerful as a Ferrari 488 GTB. IND’s best run was achieved in fifth gear with the BMW using the Sport Plus setting. Another run was also attempted with the performance sedan in Eco Mode, but the output was only reduced by around 15 hp. 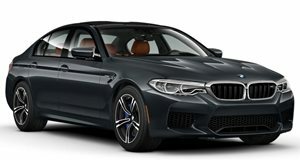 In Sport Plus mode and rear-wheel drive, the M5 maxed out at 152 mph and generated a maximum output of 593 hp and 578 lb-ft of torque. Given that the BMW’s S63 powertrain is apparently easy to modify, it’s probably only a matter of time before we see some tuned M5s with crazy horsepower figures.